Anntian clothing is casually effortless and unique; the latest collection entitled Surficia included prints such as orange rust. 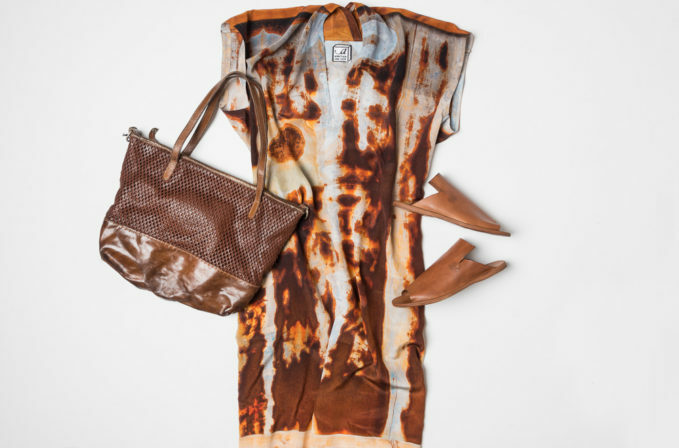 This print is used in the Anntian silk rust print dress, which is hand-printed. The shape is boxy and relaxed which can be finished with a pair of Officine Creative warm brown leather sandals. Vive La Difference handbags are made from leather that is treated similar to textiles that creates subtle characteristics in the finish. A brown Vive La Difference handbag compares to the nuances of the Anntian dress.